When you reach for your sandwich at lunchtime, it doesn't have to be loaded with peanut butter and jelly to contain sugar. Even if the fillings aren't sweet, the sandwich often contains sugar or even high-fructose corn syrup in the bread. Although you might not find white bread to be overly sweet-tasting, each piece you eat typically contains more than a gram of sugar. If you're concerned about your sugar intake, be vigilant about checking bread labels to find a low-sugar product. White bread is one of a number of products that contains sugar without appearing noticeably sweet. According to the USDA National Nutrient Database, one slice of commercially prepared white bread has 1.4 grams of sugar. In a sandwich with two slices of white bread, expect to get nearly 3 grams of sugar from the bread alone. White bread companies typically add sugar to their products during manufacturing. In one major brand, for example, sugar is the third ingredient behind flour and water. On its own, however, bleached wheat flour contains a trace amount of sugar. Per cup, this type of flour has nearly half a gram of sugar. Expect to find some degree of sugar in products that contain white flour. A 4-inch diameter white pita made with white enriched flour, for example, contains 0.4 gram of sugar. A 6.5-inch diameter white pita, meanwhile, has 0.8 gram of sugar. Reduced-calorie white bread might have fewer calories than regular white bread, but it still contains sugar. 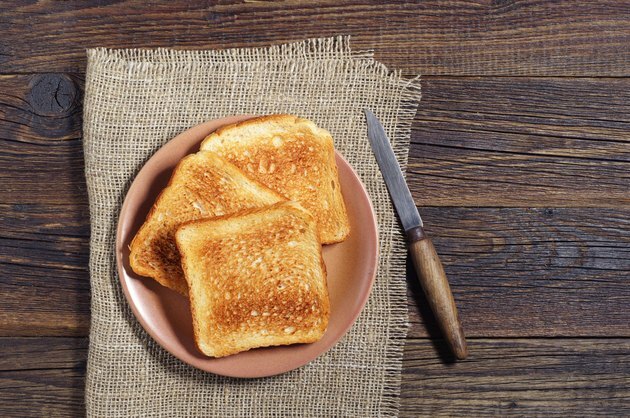 One slice of reduced-calorie white bread contains 1.1 grams of sugar. The food industry often markets whole-wheat bread as a healthier alternative to white bread, but whole-wheat bread is also a source of sugar. A slice of whole-wheat bread, which is slightly heavier than a slice of white bread, has 1.4 grams of sugar. If you wish to completely avoid sugar in your bread, look for a loaf made with an artificial sweetener. Other options include using a lettuce wrap for your sandwich or looking for a sugar-free bread at a health food store.